Extension reports all warnings detected by rubocop as problems and decorates significant characters. I'm having the issue that some warnings reported by rubocop (when run manually) do not show up in the editor (0 problems, no decorations). I noticed this applies to errors where start_column/last_column in JSON output of rubocop are identical. Are you sure it's required to subtract from offense.location.length? Removing the subtraction appears to fix this error and also a glitch where the last character of an error is not decorated. I'm sure it is required as VSCode uses a 0 offset while RuboCop uses a 1 offset. Do you have an example file I can use? Is this true for both lines and columns? yes it is true. You aren't taking into account that RuboCop is outputting an end position before the start position for this particular error. That's why it appears to "work" when you remove the subtraction. This time VSCode correctly indicates a warning, but fails to correctly highlight its boundaries. Yes. Interestingly with both current behavior and proposed changes. I agree it's probably not as straightforward as I think. Thanks for taking a closer look! 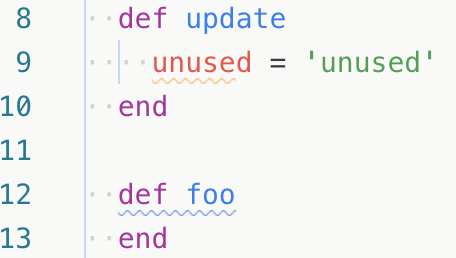 Attempting to avoid any misconceptions, main issue being here that VSCode does not detect some errors at all (apparently those with range.end.character = -1). Sometimes the RuboCop error does not encompass the whole warning (I just reproduced this as well). 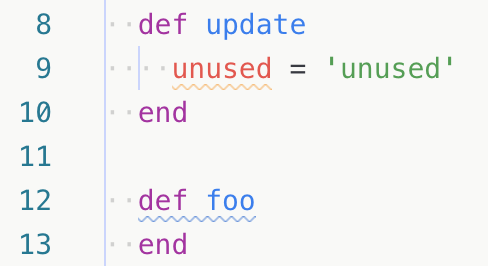 That seems to indicate the translation between what RuboCop outputs and the VSCode file mapping is inconsistent.